Badges for Baseball is a core program of the Cal Ripken, Sr. Foundation, (CRSF). It began in 2009 and has served over 100,000 youth in twenty different states and twenty seven different communities. Created by the CRSF it partners with local law enforcement agencies and trains police volunteers to use Foundation programs like Quickball and Healthy Choices Healthy Children as a vehicle to positively influence their relationship with youth and visa-versa. The Sarasota Police Department began its program in the spring of 2014. Once a week six volunteer officers come to the Roy McBean Boys and Girls Club. What they do there will vary but a common theme is to engage the kids via new activities or simply discussion. An example of the former was a bocci ball program introduced by 25 year law enforcement veteran Sgt. 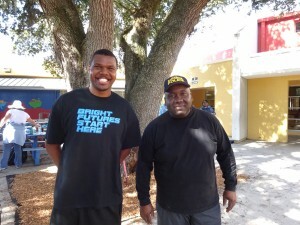 Eric Bolden pictured below (R) with McBean Club Director Nate Brown. You can imagine the initial laughing skeptical reaction of the kids when Sgt. Bolden told them of the next week’s planned activity- and, yes, you can predict the rest of the story. The kids loved it. For me, one of the most encouraging things was listening to the very first discussion session between the female teen club members and and the Badges for Baseball Police Officer volunteers- four male and one female police officer that day. Much to my own and the Officers’ surprise the conversation back and forth was non-stop and substantive. I was particularly moved by how attentive these young women where when these successful male role models spoke about the standards and criteria they’d want their own daughters to use in selecting male friends AND WHY. Will be interesting to follow-up in a month and get direct reactions from the officers themselves and the participating teen age girls….